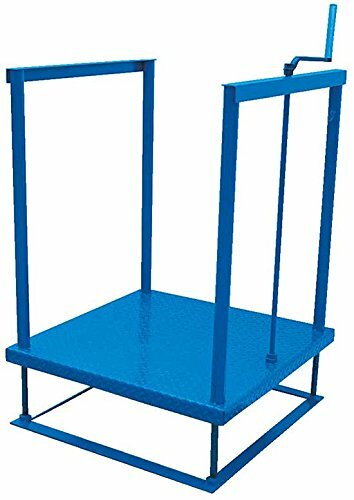 Adjustable Work Platform - BPOS Series; Platform Size (W x L): 36'' x 36''; Raised Height: 19''; Lowered Height: 3''; Capacity (LBS): 500; Operation: Hand Crank by Beacon World Class Products at N Online Agency. MPN: BPOS-3636. Hurry! Limited time offer. Offer valid only while supplies last. The Adjustable Work Platform - Step Platform is designed to minimize worker fatigue and back pain and reduce the risk of cumulative trauma injuries. The Adjustable Work Platform - Step Platform is designed to minimize worker fatigue and back pain and reduce the risk of cumulative trauma injuries. This series is an ergonomic, adjustable-height worker positioner. The platform height is adjusted via hand crank, which can be removed. These models utilize ACME threaded rods along with a series of gears for proper height adjustment. Platform Size (W x L): 36" x 36"
If you have any questions about this product by Beacon World Class Products, contact us by completing and submitting the form below. If you are looking for a specif part number, please include it with your message.